Choose station in the top right. Record starts at time stated in header (UTC), sheet has four hours, 10 minutes per line. 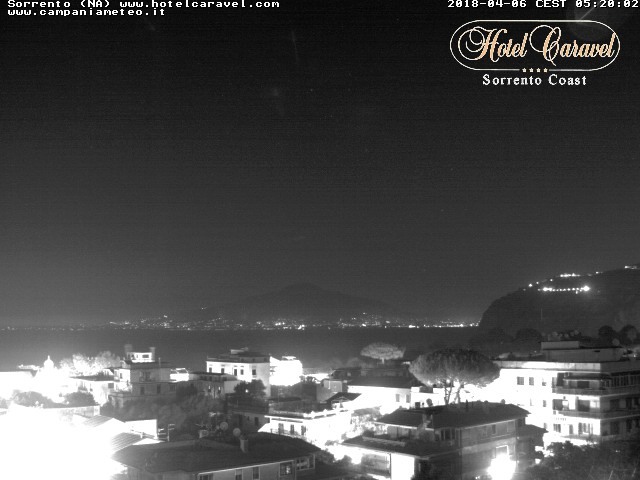 From Astronomical Observatory of Capodimonte INAF, eastwards, with the center of Naples and Vesuvius in the background. Located at "Hotel Mediterraneo" in S.Agnello, Sorrento, offering impressive views of the Sorrento peninsula and Vesuvius; 20 km S of the volcano. 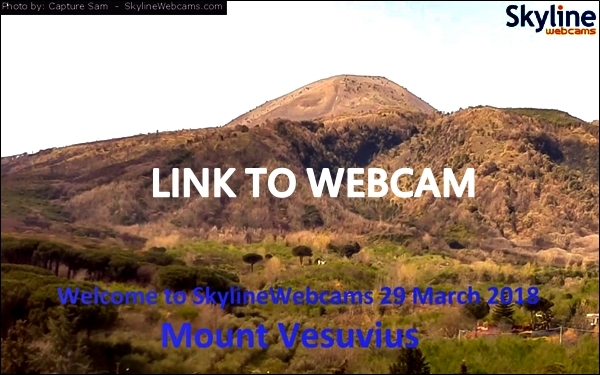 Opens live streaming webcam of Vesuvius' summit on the Skyline Webcams page. 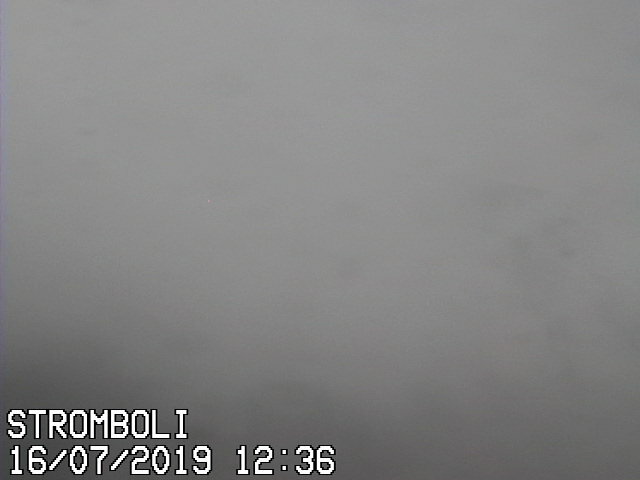 Webcam located some 4-5 km ESE of the summit. Vesuvius seen from Boscoreale, ~7km SE from Vesuvius. 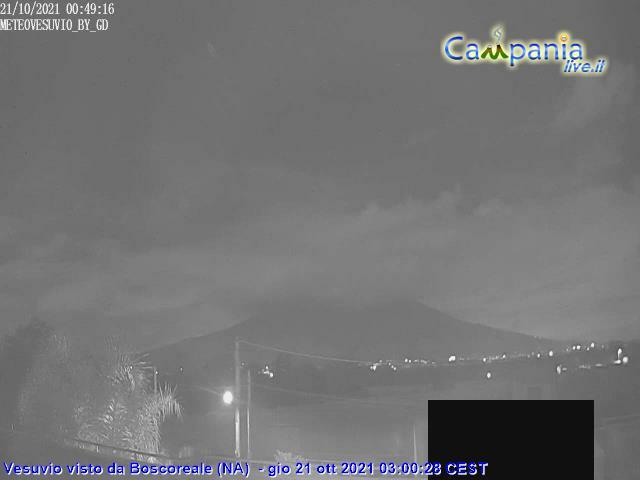 from Grand Hotel "Aminta", 23 km SSW of the volcano. 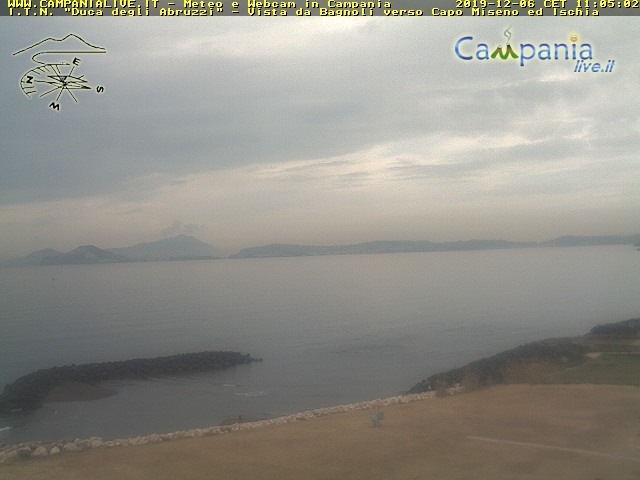 Campi Flegrei are part of a large, 12x15 km caldera, this being a vast depression originated by a structural collapse following one or more large-scale volcanic eruptions. The Campi Flegrei caldera has been largely filled by volcanic products from eruptions originated after the caldera formation, so that the general appearance to-date is that of a generally flat area punctuated by several post-caldera volcanic craters. The Campi Flegrei caldera lies 9 km west of Naples. It is completely surrounded by populated areas in the town of Pozzuoli. Houses are built right to the crater rim. Campi Flegrei is a restless caldera, with periods of unrest in 1969–1972, and 1982–1984. Current activity at the volcano consists of solfataras in the crater. The caldera and its surroundings are inhabited by more than 1.5 million people. Volcanological map of Campi Flegrei; Areas in red lines show the crater rims of "recent" activity. Click on image for source and credits. Seismograms: 'BAC V' & 'STH V' (top of this page). Beautiful view of the Gulf of Pozzuoli, with Miseno head in the middle ground and Ischia in the background; overlooking the waterfront of Bagnoli. View is in WSW direction, enabling effective monitoring of weather and sea conditions which is important both for fishing and for the many shipping lines that run through this area. The Ischia volcanic complex has an interesting & unusual geologic history. The last eruption occurred in 1302 when a vent opened in the area of Flaiano and emitted a lava flow which lasted for two months. The lava flow is between 500 and 100 m wide. It reached the beach between Porto d'Ischia and Ischia Ponte and destroyed the old village of Geronda. The eruption caused much panic and many people escaped to the nearby islands and continental coast. 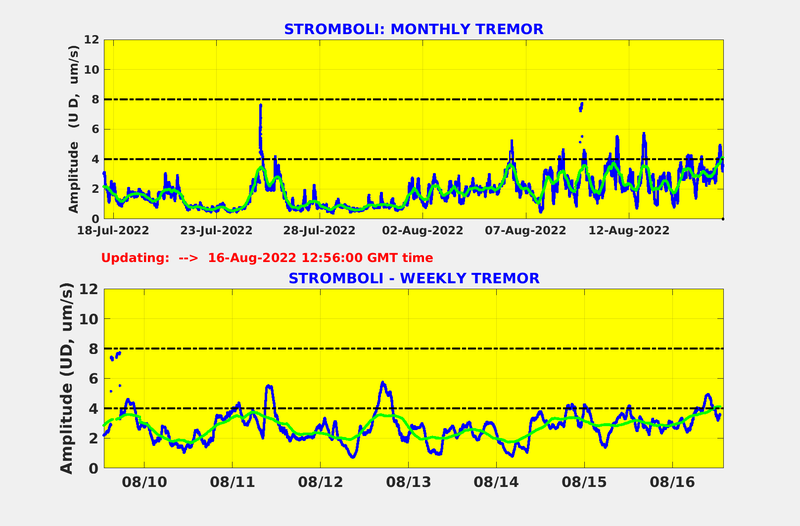 The only volcanic activity since has been the fumarolic emissions all over the island. Seismogram: 'OC9 V' (at top of this page). View west along Maronti Beach towards the seaside town of Sant'Angelo and Punta Sant’Angelo, one of the 18 lava domes in the volcanic complex. Some areas on this beach are closed off, as fumaroles escape here at a temperature of 99°C. 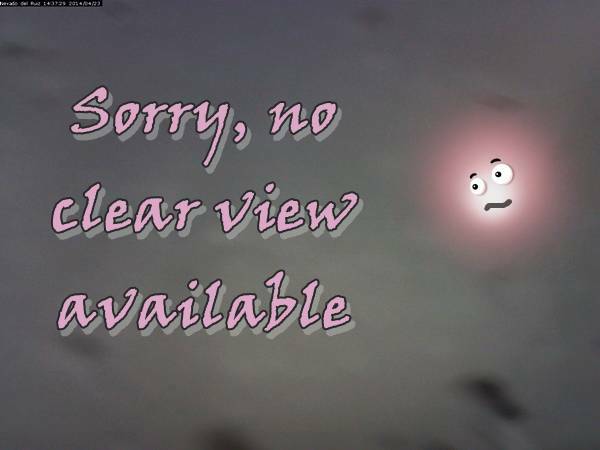 Note: Some of the following embedded images may cause your page to reload automatically. IR cam on ROC station. Looking SW down on the crater. IR cam Punta dei Corvi (GST). Looking E up to the crater. 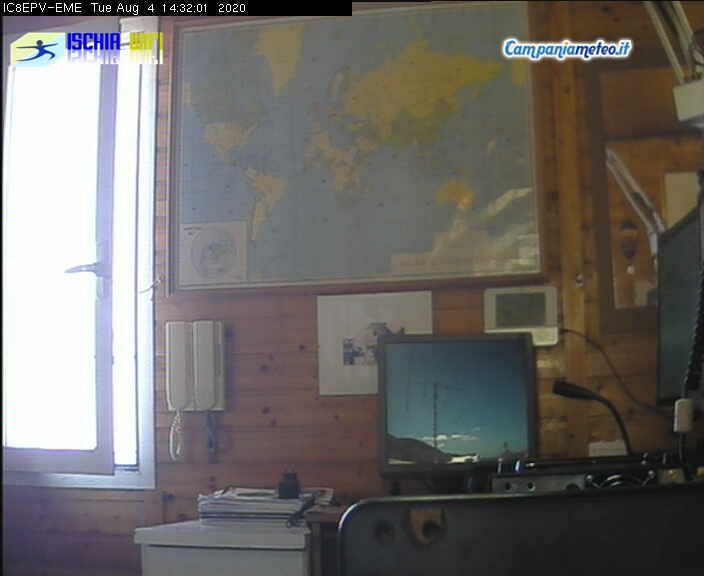 Cam on OSV station. Looking roughly W across the mountain top.